Our conference venue is versatile and fully equipped, we provide an ideal venue for all kinds of events, be it corporate, gala dinners and more. At Cayotes hotel and conference centre the possibilities are endless. In the tranquil of Nelspruit lies Cayotes hotel and conference centre nestled beneath the magnificent Mbombela Mountains, it is a compelling blend of business-like convenience and efficiency along relaxed and high-class hospitality. 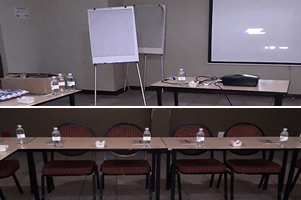 Coyotes Conference Venue makes use of 4 separate conference rooms with customizable layouts to suit your conferencing preferences, our facilities can accommodate up to 150 delegates. Our conference venue as far as conference venues go it has 4 conference halls with one sitting a maximum of 70 delegates, the second one sitting a maximum of 30 delegates and the last two sitting a maximum of 25 delegates respectively. Our conference facilities are equipped with the following amenities to make your corporate meetings or conferencing easier.